B1G Notes: Which freshman would you take? 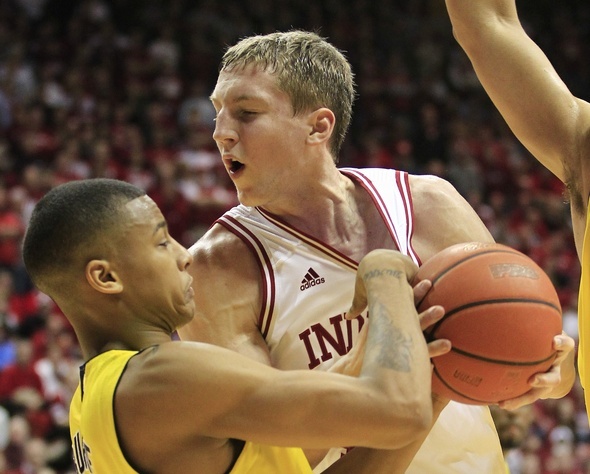 Michigan's Trey Burke or Indiana's Cody Zeller? The Big Ten Freshman of the Year award is a two-man race between Michigan guard Trey Burke, left, and Indiana center Cody Zeller, right. Two of the biggest impact basketball players in the Big Ten this season are freshmen. Michigan point guard Trey Burke and Indiana forward Cody Zeller have transformed their respective clubs so far this season and are arguably the best, and most important, players on their respective teams. The Big Ten Freshman of the Year race is far from over, but it's never too early to start handicapping. If there's one certainty in this debate, it's the fact that it's almost certainly a two-player race. Zeller and Burke have combined to win eight of the league's 10 Freshman of the Week honors. Zeller has grabbed five, Burke three. Burke, though, also boasts a Player of the Week honor this season, something Zeller doesn't have. Cody Zeller leads Indiana in scoring, rebounding, blocked shots and steals. Zeller's decision to sign with Indiana out of Washington High School last season was front page news in the Hoosier state, and he was instantly saddled with the program’s “savior” tag. Although there’s been a bump or two along the way, the 6-foot-11, 230-pound center has done a remarkable job of living up to the hype. He’s putting up 14.8 points per game, 6.4 rebounds and shooting 65.3 percent from the floor. When Indiana is clicking offensively, everything seems to run through him. If anything, the Hoosiers have been guilty of not giving him enough touches at times this season. He's Indiana's leading scorer, rebounder, shot blocker and steals man. Zeller's presence in the middle has coincided with Indiana turning itself from a Big Ten bottom dweller into a Big Ten contender. There are other factors at play when looking at the Hoosiers' revival (Jordan Hulls, Victor Oladipo and Christian Watford have been pretty good, too). But Zeller's the team's best player. Trey Burke averages a team-high 14.6 points and a Big Ten-best 34.5 minutes per game. The 5-foot-11 freshman from Columbus, Ohio, has gone from a player Michigan hoped would give them a boost this season, to a cog the Wolverines cannot live without. Burke's slightly behind Zeller in the scoring at 14.6 points per game, but he plays more minutes than any freshman in the league, averaging a team-high 34.5 per game. When Burke got into early foul trouble on the road at Iowa, the Wolverines crumbled. No longer does anyone ask whether or not Burke can fill the void left by current Los Angeles Laker Darius Morris, but instead, folks wonder if he's a better option. Sort of hard to fathom when you consider Burke spent a good portion of his prep career wading through mid-major offers. Through 19 games, he's easily been his team's most valuable player. Both great players, both extremely important — but who wins the award? The Wildcats were minutes away from grabbing their first signature victory of the season early last week in Ann Arbor and just missed. Against Michigan State on Saturday, Northwestern finally got it. The Wildcats now have a major RPI victory that no one can take away, which could be huge come bubble time in March. Northwestern is good enough to hang around in the Big Ten and put itself in position to capture that first NCAA Tournament bid. There's work to do, but the Wildcats have at least one moment to build on. The Nittany Lions looked like they might be getting ready to surprise some folks after a victory against Purdue and a narrow loss to Indiana. That all went up in smoke when they gave Nebraska its first Big Ten victory before getting dumped at home by 14 to Minnesota. Outside of Tim Frazier (who entered the week averaging 18.2 points, 6.6 assists and 5.2 rebounds), Penn State simply doesn't have the horses to run in this league. If anyone else landed in this spot, I'd probably be out of a job. The 6-foot-4 junior guard had the definition of a career night last week in an upset win over Ohio State, dropping in a career-high (and league season-best) 43 points. If that weren't enough, he also had eight rebounds and four blocked shots. He shot 73 percent from the field, went 8-for-10 from 3-point range and his 43 points were the most by a Big Ten player since 1994. Good luck topping that, Brandon. Offensive rebounds through six Big Ten games by Michigan's Jordan Morgan, a league-leading total entering the week. Wisconsin's field goal percentage, during Big Ten play, entering the week. Worst in the league. Points per game, entering the week, by Nebraska, the 295th-worst number in the country. Combined 3-point field goal percentage by Indiana guards Matt Roth and Jordan Hulls, the top two long-range shooters in the Big Ten. "Do I respect John Beilein? Tremendously. Do I respect Michigan? Tremendously. Do I like them? Not one bit." — Michigan State coach Tom Izzo. Ever wonder what coaches are saying in the a pre- or post-game handshake? For Michigan basketball coach John Beilein, it's as little as possible. "Nobody's thinking about (personal matters during a handshake). Why even go there? I don't want a guy to patronize me after a game when we lose and say, 'Oh, man, you've really got a good team.' No, just shake my hand, go to your locker room and I'll go to mine. You never blow off guys, you look them in the eye, nice game, then go to the locker room and the sun will rise tomorrow." Tue, Jan 31, 2012 : 9:11 p.m. If you'd poll Bloomington.com, you'd probably get the same biased opinion Zeller's way...lol. @ Nick Baumgardner You write with great passion that is what makes your articles so genuine. Love reading them. Keep it going. Thu, Jan 19, 2012 : 7:43 p.m.
Trey Burke will be one of the BEST Michigan basketball player, he has already proved himself. He is like Ricky Green, fast and no nonsense. I hope to watch him next three more years..
Thu, Jan 19, 2012 : 10:27 p.m. It would be a miracle to have him three more years. I pray for one. He is just great. Thu, Jan 19, 2012 : 3:39 p.m. It's important to note the level of importance regarding their positions. A point guard takes on responsibility that a big doesn't have to worry about. Running the offense is a huge responsibility on top of being a leading scorer.